all I have are succulents but ? I have only succulents but someone has left this for me and I am at a loss as to what to do with it. Where can I find out the name? Comments for all I have are succulents but ? Mary, you're in the right place! 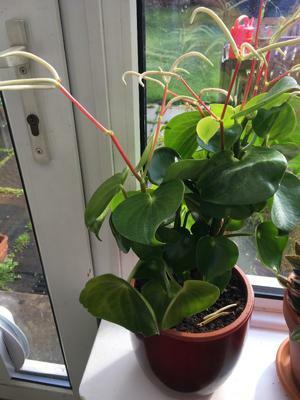 This is Peperomia, possibly obtusifolia, one of the most common types. Those spindly things sticking up are actually flowers. See more about Peperomia here. Wow, this is great news. Such unusual flowers!